After 4 children I can honestly say there are still times when this is a very big reality. 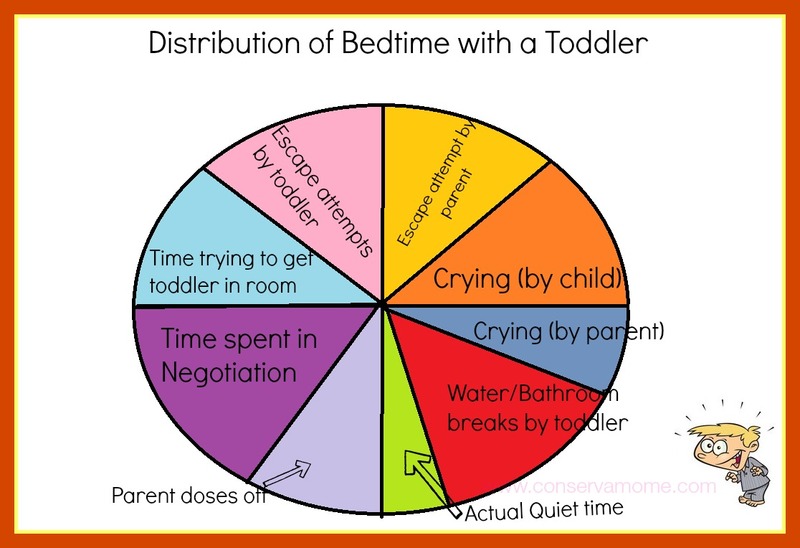 Enjoy a Distribution of Bedtime routine with a toddler(although this probably applies to most kids)! We’re not at this stage yet, bedtime is still pretty simple….but I know this little girl of mine is gonna give me quite the time of it. We’ve been struggling with our twins at bedtime. A little humor sure helps! Pretty much covers it! Lol! Adorable! But perhaps there should be more time negotiation? :-O And maybe a little piece for snuggling. 😉 I agree with Shanna… some of these seem to be forever issues… even with teenagers. Lol! This is funny I have to say, yet very true. I have a 3 year old and I have these issues on a daily basis. This is hilarious! I’m still co-sleeping with my almost three year old, but that doesn’t stop her from trying to do anything BUT laying down and falling asleep. The other night she said she had to get up and brush her teeth again because a drink of water made them dirty. Toddlers are too funny. I bookmarked this page when I saw it this morning to show my husband when he got home. He laughed out loud, and was very happy to know we really aren’t alone. Thanks! Oh man! Does that ever hit the nail on the head?!! I think I would have had to make a few adjustments to my pie chart, but it would have looked very much like yours! this is happening at my house Right Now. with a 3 and 4 year old. bah. I can’t wait until my guy is tough to put down! LOL- this made me smile- For us, brushing teeth is the hardest part! It is sometimes accompanied by tears! This is such a great distribution chart. I am smiling as I comment on it. I am sure that there almost isn’t any parent who hasn’t had these problems. My two year old does go to sleep pretty well but we do have nights like this. Seems to always happen when my husband is out of town for work. I almost pass out like a dozen times before I can get the baby to sleep! So hard lol. My daughter is 6 and she usually goes to bed really easily as long as she has her silky blanket. She will not sleep without it. Luckily my toddlers go down pretty easily but we occasionally have these nights! Pretty spot-on! I have 6 kid’s and I have to say, bedtime never got easy with all my kid’s. It was a work in progress everytime. Oh no! I hope my little guy is better at going to bed. I’m not looking forward to this! If I could find the off switch in my three year old, it would be awesome!! This chart is so true! lol sooo not looking forward to this stage with my little one! We are not fully there yet but I can see it coming! This made me laugh. My daughter just turned 1, so we haven’t reached this stage yet. Right now she runs around the living room until she is tired and then she comes and puts her head on my lap and whines until I put her to bed. I have a newborn and I was hoping my sleep would get better. I am not looking forward to this stage. I hope I know more about how to handle this by the time my baby is a toddler! My brother found my nephew sleeping UNDER his new bed during one of his first night without a crib! It was too funny! I think I might have drawn this while in a sleep deprived state! LOL!!! Oh how I don’t miss this! Luckily mine grew out if it pretty quickly for the most part. My grandson is the great sleep resister. He is the master of doing without sleep and has never taken more than one nap a day since 2 months of age! He is now 2 1/2 and needless to say, everyone is exhausted….and yet, we wouldn’t trade any of it for the world. So true! They come up with the most creative excuses to avoid bedtime. Of yes! Don’t forget the “starving” phase of putting a toddler to bed! We had to incorporate a before bed snack to battle it! Yeah, my kids put up a huge fight just hearing the word bed time. they scream and cry while i brush their teeth. lol my youngest is 1 and I hate hearing her cry when I try to put her down in her crib. I need to get better at giving her a bed time! We are so blessed to have a daughter that has always been good with bed time. I thought we would have issues when we recently switched her to a toddler bed but 2 weeks in and all is well. I cannot complain! Just babysitting our nieces and nephews has shown us how this works… hopefully when the kids are actually yours there’s a LITTLE less chaos every night! Oh no! I was hoping not to encounter the horribleness!